In order to successfully take advantage of molecular motors, they must be able to work together. However, incorporating billions of these nanometer-sized motors into one system and making them work simultaneously have proved to be relatively tougher. Presently, organic chemists at the University of Groningen have been successful in combining many unidirectional light-driven rotary motors into a metal-organic framework (a solid material with a 3D cage-like structure). Particulars of their finding were reported on March 18th, 2019 in the journal Nature Nanotechnology. Ben Feringa, an organic chemist at the University of Groningen, first created the light-driven rotary molecular motors. The 2016 Nobel Prize in Chemistry was shared by Prof. Feringa and two others for this innovation. Collections of different types of nanoscale molecular motors have been mounted to surfaces and incorporated into liquid crystals, gels, and muscle-like fibers where they can carry out work on a macroscale, through cooperative action. However, the production of an ordered array of these motors in a 3D solid-state material has remained beyond the understanding so far. A research team at the University of Groningen, headed by Ben Feringa, Assistant Professor Sander Wezenberg, and Professor Wesley Browne, accepted this challenge. They have presently developed a working system consisting of 3 x 1020 (a three followed by 20 zeros) light-driven unidirectional rotary motors per cubic centimeter, which all operate together. The researchers housed the motors in metal-organic frameworks (MOFs), molecular cages composed of metals with interconnecting “struts” of organic molecules. Ordered 3D stacks of these molecular cages create crystals. After these crystals had grown, the team replaced the vertical pillars with motor molecules via a process called solvent-assisted linker exchange. At an earlier stage, it was impossible to insert the motors, since they would not have been able to endure the conditions essential to produce the MOFs. The stator components of the molecular motors act as the pillars of the cages, whereas the rotor components remain free within the cages. The cages were developed to be sufficiently vast to enable the motors to operate freely, without any difficulty. The motors themselves were enabled by irradiating the crystal with UV light. Tests on these systems revealed that the motors were mainly oriented in the same direction and that their rotational speed was comparable to the speeds realized in liquids. 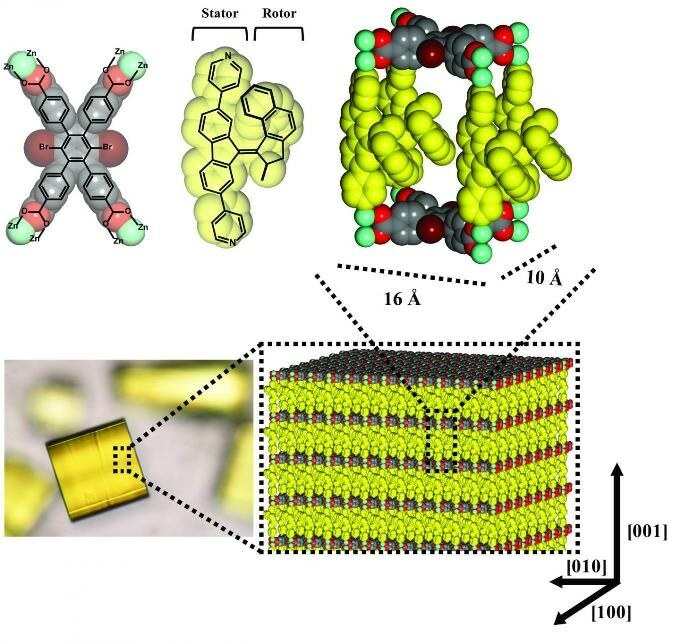 The team was pleased since earlier efforts by other groups to integrate rotaxanes (another type of molecular machine) into MOFs revealed the inability of these motors to run freely. Therefore, a “motorized MOF” can now be developed, in which huge numbers of molecular motors are packed densely together to form macroscopic crystals. Theoretically, such crystal could be used to control the diffusion of gases, or they could operate as light-powered pumps in microfluidic systems. Another promising application would be to supply the motorized MOF with materials that would subsequently react within the cages prior to being pumped out again. However, further research is required before any of these applications can be put into action. For instance, one possible challenge is that materials passing through the cages could interfere with the operation of the motors, causing the system to get jammed. However, the system demonstrated by Prof. Feringa and his team will offer a springboard for further investigations of the collective behavior of rotary motors incorporated into 3D arrays.